It has been years since New York has seen anything quite like the old Copacabana. The Copa, Manhattan's best-known night club, was also the most popular nightspot in America. From the moment it burst onto the scene in 1940, an aura of glamour and sophistication hovered over the Copa. It was a luminous glow that, over the course of five decades, served this illustrious establishment well, beckoning the people who made it famous-Hollywood stars, sports heroes, foreign dignitaries, and the town's leading families, including the Kennedys, the Roosevelts, and the Du Ponts. The Copa was a showcase for past, present, and future stars, including Joe E. Lewis, Sophie Tucker, Jimmy Durante, Julie Wilson, Tony Orlando, and Wayne Newton. 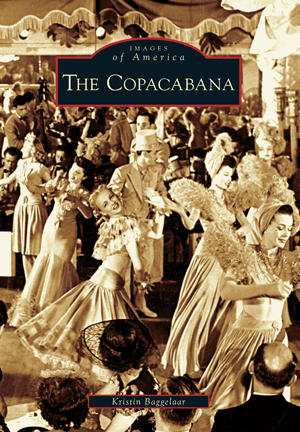 Through vintage photographs and stories from performers, Copa Girls, and other people connected with the Copa's history, The Copacabana chronicles how this landmark institution became an American cultural icon. Kristin Baggelaar is the author of Folk Music: More Than a Song and The Folk Music Encyclopaedia. A portion of all sales of The Copacabana will be donated by the author to the Society of Singers, a charitable organization that helps professional singers in need and works within the entertainment community by directly supporting the future of aspiring singers with vocal arts scholarships.